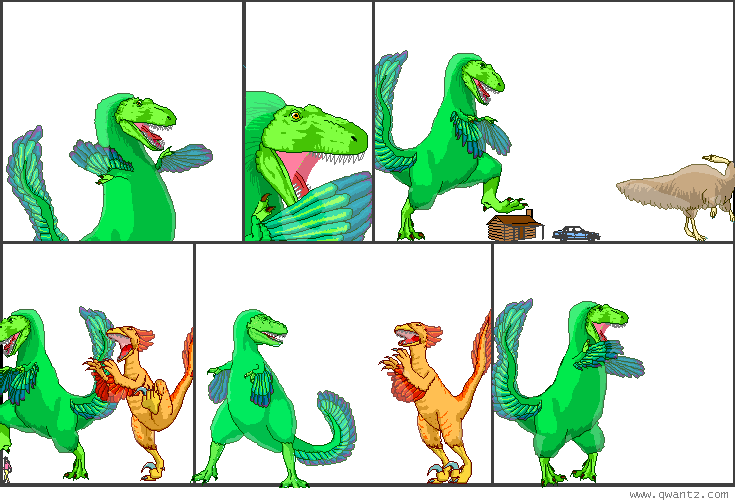 Dinosaur Comics - March 30th, 2010 - awesome fun times! –And then later on everyone was like "where's my flying car"?? March 30th, 2010: Guys, it's spring, and I don't have a spring footer! Oh snap! Tomorrow can't be all ice cream on wheels if the bottom of this website still thinks it's winter. Can you help me out? Here's the fall footer and the winter footer. I'm looking for something springy that's also 1000x96 (though it can be taller), has a not-too-busy background that can be tiled nicely, and that has the house and tree in the same location! You can email your image to my email address right here. I'll post the winning entry as well as all the runners up in a few days, and if you've got a site you'd like me to link to with your image, please let me know!